In PerformancePoint Services, the security settings for data sources are stored in each data source. For Analysis Services, you have the choice of having all users connect by using the Unattended Service Account, the Unattended User Account and add authenticated user in connection string, or you can authenticate using Per-User Identity. Per-User Identity requires Kerberos protocol. PerformancePoint Services accesses external data sources by using a delegated Windows identity. Consequently, external data sources must reside within the same domain as the SharePoint Server 2010 farm. If external data sources do not reside within the same domain, authentication to the external data sources will fail. For more information, see Planning considerations for services that access external data sources. 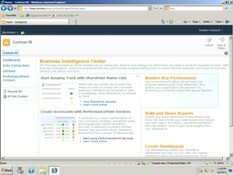 Create an Analysis Services data source by either entering the name of the Analysis Services server, database and cube name, or by typing a connection string and the cube name in the Dashboard Designer. It is recommended that you select your authentication method before you specify your server connection. Click the Create tab, and then click Data Source. In the Category pane of the Select a Data Source Template dialog box, click Multidimensional and then click Analysis Services. Click OK. In the left navigation pane (workspace browser), type the name of your data source. In the Data Source Settings section, select the method by which to authenticate to the data source. In the Formatting Dimension drop-down list, select desired dimension formatting needed for the report. In the Cache Lifetime drop-down box, type the refresh rate (in minutes) for the cache. Data from this data source will update at this interval. In the center pane, click the Editor tab. In the Connection Settings section, select the method by which to connect to the data source. Type the full path for the server to which you want to connect. This populates the options in the database list. In the Database box, select a database name. (Optional) In the Roles box, type the name of the role, such as an administrator or database role. To specify multiple roles, type the names of the roles and separate them by commas. Select Use the following connection. Type the connection string to the server including the cube name to which you want to connect. From the Cube drop-down list, select the specific cube that you want to use as the data source in the database. Click Test Connection to confirm that the connection is configured correctly. To view a demonstration of how to create an Analysis Services data connection in PerformancePoint Services, watch the following video. Watch the video | To download a copy of the video, right-click the link, and then click Save Target As.